See President Trump‘s hair in the wind here. — CNN media writer Oliver Darcy. “I’d like to take a moment to thank my neighbors for not murdering me in my sleep last night even though I left my keys in the door & they totally could have.” — Sydney Elaine Leathers, former sexting partner to New York Democratic ex-Rep. Anthony Weiner, who is in the slammer for sexting with a minor. “The dog I am helping take care of just peed on the couch beside me. How is everyone’s afternoon going?” — Cameron Hawthorne, Washington Free Beacon. “Genuine question for the progressive Democrats still upset about what happened with Al Franken: How do you think the Brett Kavanaugh hearings would have played out if Franken was still in the Senate and on the Judiciary Committee?” — Matt Berman, politics editor, BuzzFeed News. BTW… Franken hasn’t ruled out running for office again. “Ladies, unless you’re tweeting that when you went through TSA today, you overheard some dude saying how he wished he could get a look at your autoporn [sic] machine pic because he likes boobies, I am not gonna believe anything you tweet about ‘TSA agent said this. '” — Liz Mair, Republican communications strategist. “Klobuchar: ‘If you’re confirmed, will the Justice Department jail reporters for doing their jobs?’ Barr does not answer directly. Says he ‘can conceive of situations’ whereas a ‘last resort’ that could happen, especially if a news outlet has run through a ‘red flag. '” — Seung Min Kim, White House reporter, The Washington Post. About that school that hired Veep first lady Karen Pence… Here. Ohio Democratic Sen. Sherrod Brown is going on a listening tour: “Sen. Sherrod Brown’s announcement on MSNBC is that he’s planning a ‘Dignity of Work listening tour’ and going to the early primary states. Says he wants to ‘continue to learn about the dignity of work. '” — The Daily Beast‘s Gideon Resnick. NBC offers its employees guidelines… on use of the word “racist” as a descriptor for Rep. Steve King (R-Iowa). Here. What a trip… “What appears to be an eighth-grade field trip to the Capitol is in the gallery, watching King defend himself over his racist comments.” —Joe Perticone, reporter, Business Insider. Jeff Bezos’s love life — if you can stand reading any more about it. Here. Shockingly, the online mob largely forgave Zach Ford. He says he’s going to try to be “more sensitive” in the future. 1:30 p.m. Tuesday — “The punishment for armed robbery is not death, though. 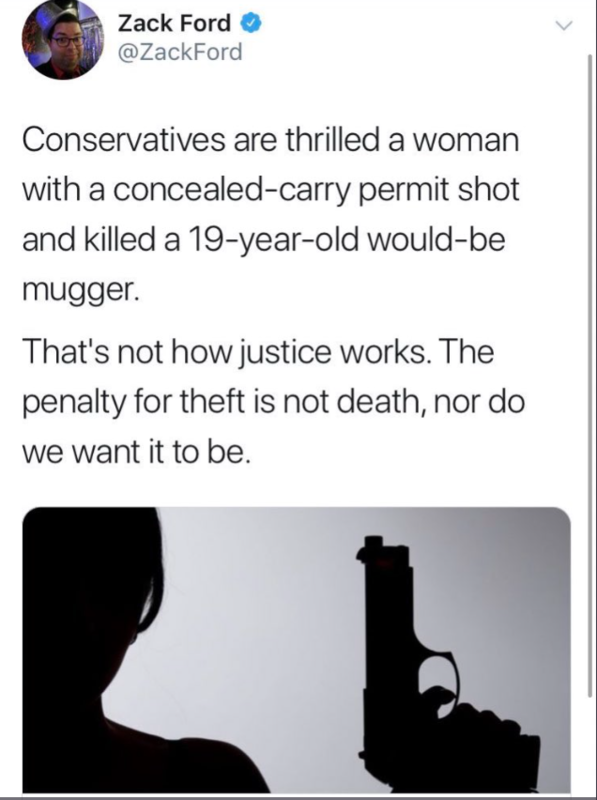 Of course I don’t think he should have had a gun either, but if she had let him rob her, even at gunpoint, both likely would have survived. It’s the praise for her gun ownership that bothers me.” — Ford. “The penalty for mugging is the self-defense of the person being mugged. If that’s you getting shot, that’s you getting shot,” he tweeted.